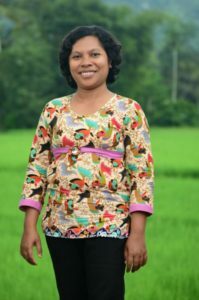 “To take care and educate your own child is simply a task of parents and almost everyone does it, yet to do the same for the other children is a matter of choice,” said Henderina in a conversation with sponsorship staff while meeting in her home. Yes, Henderina is one of those who chooses to educate not only her children – Yedija and Grace, ages 3 and 9 respectively – but also the other children in her community, at their sponsorship supported Reading Camp. She has been trained as a community volunteer by Save the Children in order to run the Reading Camp in her house for the local children. She believes that reading can be the window for the little villagers to see the world and to achieve their dreams. As the Reading Camp had just been established, children ages 6 – 10 came with great enthusiasm. They came together to play games that strengthen their literacy skills and to learn to read the newly provided books. “It was such a joy to see children enjoy the games and learning. You can see that this is what they really need, to play and to learn through games with their peers.” Before sponsorship helped establish a Reading Camp in their community, children had very little access to books or other reading materials. Most have no books at home of their own, and there was no community library available. After the Reading Camp was established, children like Maksimilianus, Fransiska and Ananda came with great enthusiasm. With the creation of the Reading Camp, two challenges of improving the reading ability of local children were solved. Firstly, with the provision of books, which could also be lent to children so they could read them at home. Secondly, through the provision of a passionate facilitator like Henderina, who helps them to be motivated to learn and who encourages group learning styles that makes learning amongst friends fun for the children. Henderina realizes that children this age cannot be forced to learn in a way adults may be able to. They need friends. They need to play. Therefore, in her Reading Camp, she tries to incorporate learning through play every day. Children can learn phonetics, letters and vocabulary through singing, playing games, solving puzzles and storytelling. Henderina dedicates her time for the children happily, having fun too with them in the Reading Camp. Running the Reading Camp in a community where not all parents are aware of the significance of education and literacy is not without challenges. One of them is finding a way to get parents excited about sending their children to the Reading Camp. Some assume that sending their children would be a waste of time, and would rather have their help around the home, such as by collecting firewood, fetching water and caring for the family animals. Henderina believes that the primary reason for this is the low awareness among parents on the great impact that being allowed to learn while playing with their friends can have on their children. Because of this, she has taken it as part of her role as community volunteer to visit every family with children in her community, to discuss the importance of educating their children and to encourage the parents to send their children to the Reading Camp. Author Yasintha working with kids who benefit from sponsorship programs like Reading Camps. Her efforts bear fruit as more and more children come to her Reading Camp as she meets with more and more parents. Sometimes, parents even stay to participate in the activities themselves. “With this positive progress, I strongly believe that the children in my community can read like those in the city and can reach whatever dreams they may have. This can start here, from this Reading Camp,” she proudly stated. Mobilizing community members to help build our programs is an integral part of sponsorship. We provide training and tools that enable children, parents, teachers and local partners like Henderina to work together to achieve common goals. 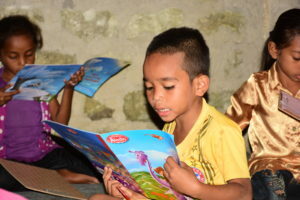 Consider sharing this story with a friend or family member, to show how you’ve helped bring the joy of reading to children in the Philippines, as one of our valued sponsors! Thank you!